Laurent Ganem, MD founded G Square Healthcare Private Equity in 2007. G Square is a Private Equity firm headquartered in London, with a sector focus investment strategy dedicated to growth and buyouts in Care and Healthcare in Europe. G Square has completed investments in Spain, Switzerland, Germany, Finland, the UK, the Netherlands, France, Norway and Belgium. 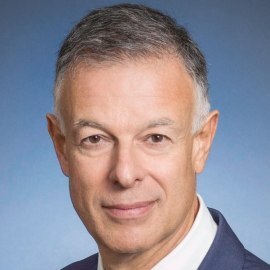 Laurent started his career at Baxter International in Chicago in 1986. In 1988, he founded and managed Ovi, a French company specialized in technology transfers and M&A advisory in Life Sciences. In 1994, he joined Apax Partners in Paris as Partner in charge of the Healthcare investment practice. From 1994 to 2007, he completed various investments in Europe and in the US, in Biotech, Medtech and Healthcare Services, ranging from early stage to growth and buy-outs. He left Apax Partners to start up G Square. Laurent graduated as Medical Doctor (’83) from the University of Paris and holds a MBA from Columbia Business School (’86).